Note: Weekly and monthly services continue as usual. See Worship. 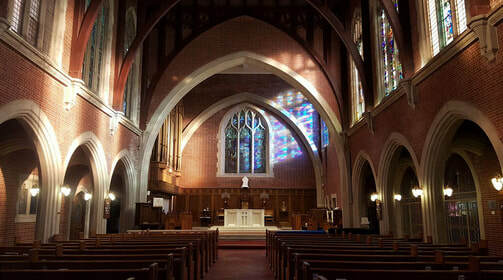 Natural light streaming through the clerestory windows of the church. Meet outside, at the corner of Bay and Montecito, for ritual procession. Meet across the street for ritual procession. Music: Calkin, Hosanna to the Son of David; Witt, Improperium; Poston, Jesus Christ, the apple tree. St. Paul's Chancel Choir. Lenten Series. Following the 10:00 am Service, in the Parish Hall. See Lent for weekly details. 12:10 pm, Holy Eucharist in the Chapel. 12:10 pm Holy Eucharist in the Chapel. 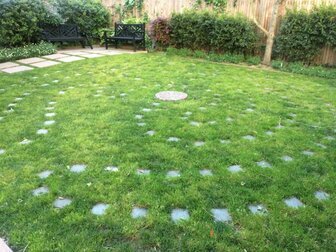 St. Paul's natural garden Labyrinth. 7:00 pm The Service of Tenebrae, Extinguishing of the Light in the Church. Sung chants, hymns, readings, and the gradual extinguishing of candles to complete darkness. With St. Paul's Schola Cantorum. 7:00 pm Maundy Thursday Liturgy in the Church. Commemorate the Last Supper, ritual Washing of Feet, and Stripping of the Altar, with Choir. Tallis, if ye love me; Duruflé, Ubi caritas; Bruckner, Christus factus est; Victoria, Unus ex discipulis meis. With St. Paul's Chancel Choir and guest soloists. 12:00 noon-3:00 pm Good Friday Liturgy in the Church. The Passion Gospel, with Veneration of the Cross. Stainer, The Crucifixion, with Tippett, Deep River; Casals, O Vos Omnes; Howells, O Savior of the World (Requiem); Harris, Bring Us, O Lord, God, with St. Paul's Chancel Choir. Guest soloists Michael Desnoyers, tenor; Nik Nackely, baritone; Evangeline Wolfe, organ. 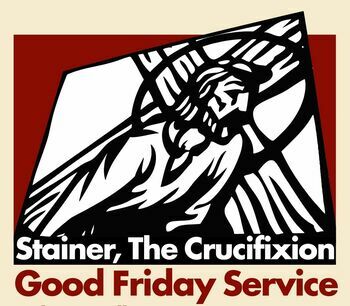 For our noon Good Friday service, the choir and soloists will present John Stainer's much beloved work, The Crucifixion. Though presented only rarely in recent decades, this substantial work was widely popular in the early 20th century, and is modeled to a degree on Baroque Passion settings like the Bach St. John, including several congregational chorales. It is a modest, solemn, and unquestionably sincere hour of music. Please make time in your Good Friday to attend this midday service, which promises to be a memorable moment in our parish life. 3:00 pm Stations of the Cross in the Church. PARKING: On Good Friday, to avoid a parking ticket, park at Children's Fairyland, 2 blocks from St. Paul's at Grand and Fairlawn. Buy 2, two-hour vouchers. Total cost $4. 8:00 pm The Great Vigil of Easter in the Church. Kindling of New Fire, Exultet. The First Mass of Easter, and Baptisms. Meet on the front steps of the darkened church, for the lighting of the ritual fire and candlelit procession. 8:00 am Holy Eucharist in the Church. 10:00 am Festival Eucharist in the Church. CHRIST IS RISEN! Join the Celebration! Short Communion Service by Charles Wood. Anthems: Handel, Hallelujah; Byrd, Sing joyfully; Asola, Surrexit pastor bonus. With St. Paul's Chancel Choir. Programs for children 3-12; care for infants & toddlers. A Festive Potluck Brunch and Children’s Easter Egg Hunt follow the service. 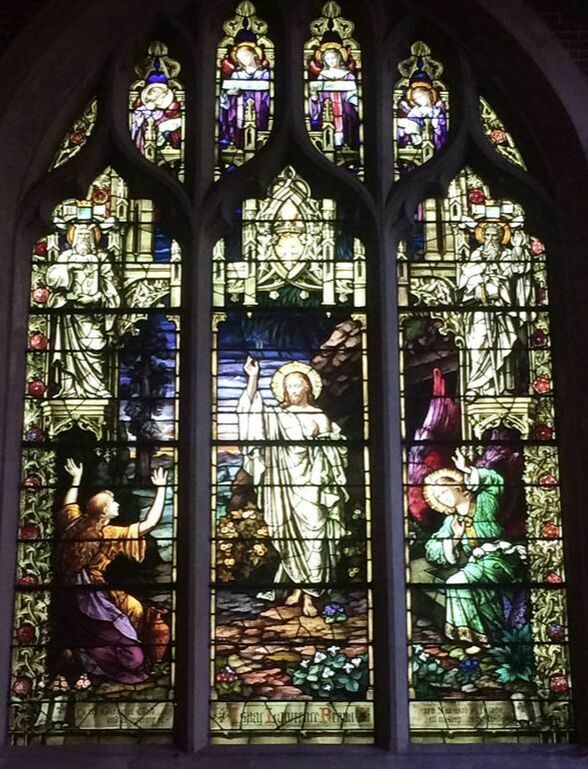 St. Paul's East Window, Resurrection Window. at St. Paul's, All Are welcome. Our baptismal vow is to seek and serve Christ in others.